Figure 1. 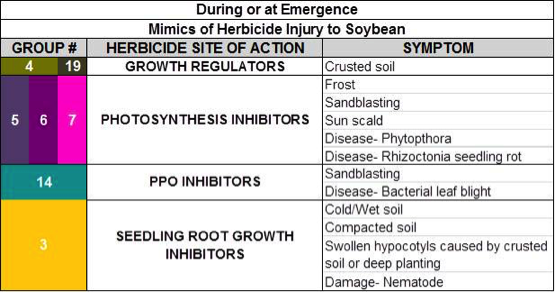 Mimics of herbicide injury to soybean during or after emergence. To diagnose an injury problem at or during emergence, first check the root system of the plant. Seedling root growth inhibitors, ALS inhibitors, and growth regulators change the root architecture in different ways. Next step, if the roots appear normal, take a look at the leaves for yellowing (chlorosis), bleaching, or drawstring (puckering). 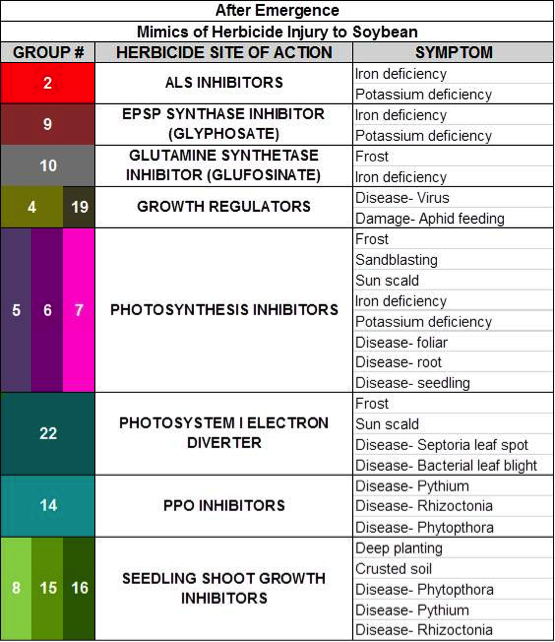 To help with diagnosis, University of Wisconsin Extension has a two-page guide, available for download at https://ipcm.wisc.edu/download/pubsPM/herbicideinjury_new.pdf , and an online diagnostic tool at http://wcws.cals.wisc.edu/herbicide-injury-diagnostic-tool/ . After emergence, PPO inhibitor injury tends to appear on the leaves that receive the application but younger leaves will not show any injury symptoms. Typical damage includes yellowing (chlorosis) and browning of the leaf surface in spots (necrosis) (Fig. 2A). Researchers at Purdue University have a five minute video discussing PPO inhibitor and fluopyram (ILeVO) seed treatment injury, https://youtu.be/GQwJodB7E_M . It is important to remember that despite the damage, in most cases yield is not affected. Also, PPO inhibitors add another site of action to your resistance management plan and effectively control a variety of broadleaf weed species. Growth regulators cause leaf cupping or epinasty (downward growth habit) (Fig. 2B). The leaves of soybean plants with ALS inhibitor injury show chlorosis and distinctive reddish leaf veins (Fig. 2C). Figure 2. A) PPO inhibitor damage, B) Growth regulator induced leaf cupping, C) ALS inhibitor injury. Injury symptoms typically appear seven to fourteen days after application and will gradually decrease through the season when the plants resume normal growth. Phytotoxicity data are available in the WCWS research reports at http://wcws.cals.wisc.edu/research/herbicide-evaluation-program/ . Each trial contains a summary section that will mention if any phytotoxicity symptons were observed. If the injury differed by treatment and exceeded five percent then a bar graph is included. Crop injury resulting from an application made according to the label instructions usually does not cause a reduction in yield. “Pest Management in Wisconsin Field Crops” shows the relative risk of soybean injury from different herbicides on pages 143 and 144, available at Cooperative Extension’s Learning Store, http://learningstore.uwex.edu/Pest-Management-in-Wisconsin-Field-Crops2015-P155.aspx .